Home Actresses Priyanka Chopra and Nick Jonas official wedding pictures out! 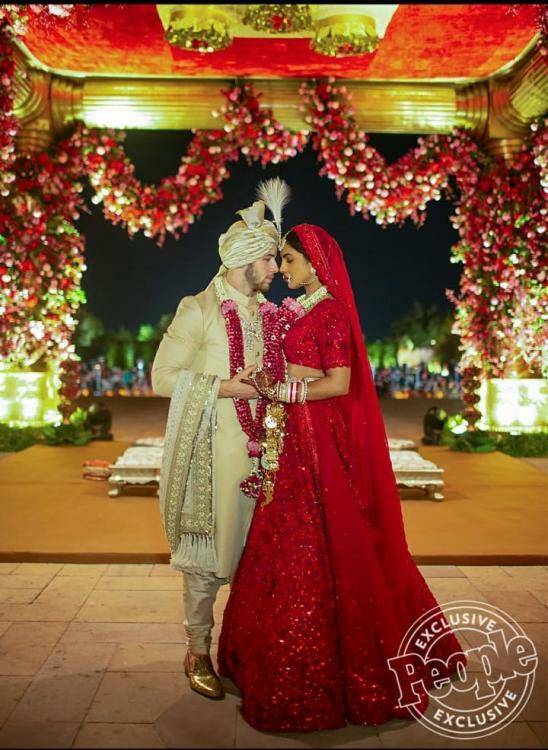 Priyanka Chopra and Nick Jonas official wedding pictures out! After a long wait, the official wedding pictures of Priyanka Chopra and Nick Jonas are finally out. The wedding pictures appeared on the cover of People’s Magazine’s latest issue. The pictures include the ones from the Hindu wedding and the ones from the white wedding held at Umaid Bhavan Palace, Jodhpur, Rajasthan. For the Hindu wedding, Priyanka wore a beautiful bridal red lehenga with minimal jewellery while the groom nick was seen in a beige sherwani with a lavish dupatta and a matching turban. For the white wedding Priyanka wore a gorgeous white gown by Ralph Lauren , which had a dramatically long trail while the groom looked dapper in a tuxedo from Ralph Lauren. Going by the pictures, it surely seems like the wedding at Umaid Bhavan was grand and lavish and the bride and groom and their family had the best time. Priyanka had earlier released a few pictures from her Mehndi and Sangeet ceremonies held at Jodhpur, which narrated the fun the families would have had at the celebration. The entire Jonas and Chopra family was in attendance for the two elaborate ceremonies. Priyanka and Nick will be hosting two wedding receptions – one in Delhi and the other in Mumbai.